If there is ever heaven on earth, it's here, it's here, it's here! This famous sentence, quoted by Mughal Emperor Jahangir hundreds of years ago, still stands true and unfailing, albeit the time and age. Kashmir Valley is the beautiful crown adorned on top of India. Some say it is a paradise on earth, others say it is a paradise by itself. 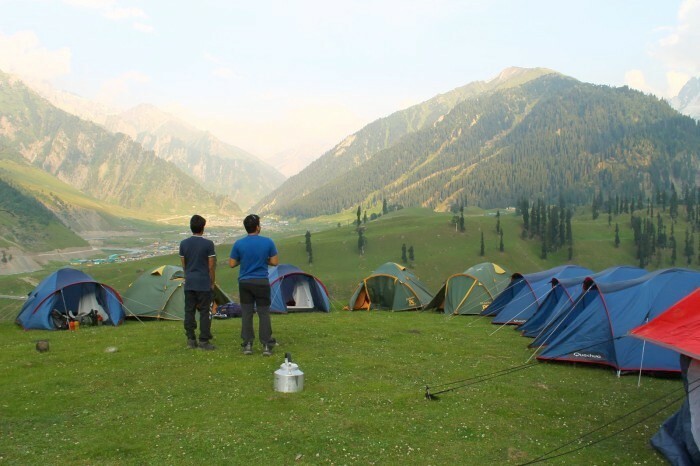 Kashmir Great Lakes Trek is considered by far the best trekking one can experience. 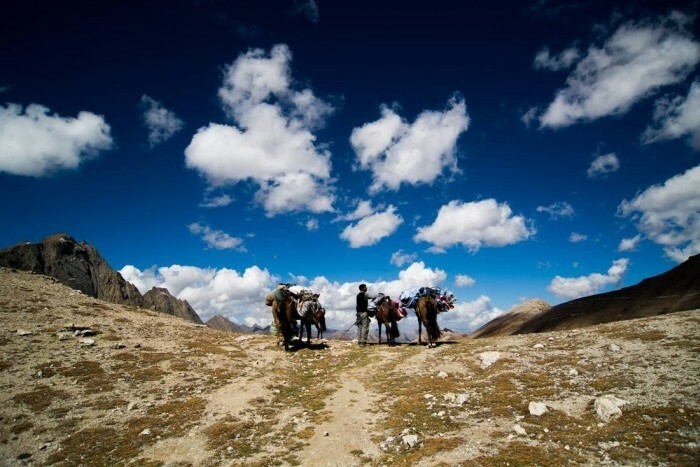 The trek is a seven day expedition, starting from Srinagar and ending with Naranag. The season to enjoy the trek is from June to August since the places will be filled with lush greens and covered with beautiful flowers. Day 1 starts the journey at Sonamarg headed towards Nichnai. Sonamarg is situated near the Nallah Sindh River and has some beautiful peaks like the Sirbal, Kolhoi, Amarnath, and Machoi. You can camp in Shekdur before continuing the trek to Nichnai. Day 2 you head towards Vishansar Lake. Trekking in Kashmir becomes interesting from here. This day you'll cross the Nichnai pass or the Vishansar Berry. The lake is beautiful, still deep blue in color that gives pleasant warmth in heart. Here you'll view waterfalls, meadows filled with deep red flowers and snow clad peaks. The Vishansar Lake is huge and nestled between four mountains. 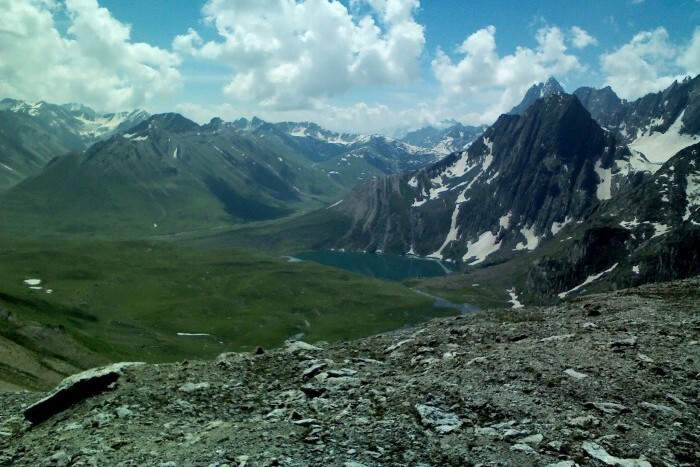 Day 3, you trek to Gadsar via Krishansar Lake and Gadsar pass. Krishansar Lake is a long stretch of stream, gurgling water and if you move upwards, you'll be connected to Vishansar Lake. On top of the ridge is the Gadsar pass from where you can observe the twin lakes. You will trek towards Satsar on Day 4th. Some of the sceneries you will observe are captivating mountains and the collection of seven lakes. On Day 5, you will arrive at the twin lakes of Gangabal, situated in the foothills of Mt. Haramukh. On the first day, trekkers will spend the day in Srinagar. Srinagar, the capital of Jammu & Kashmir, is situated in Kashmir valley. One can take a short trip to Dal Lake, which is known for its beautiful Shikaras. Srinagar is also famous for Mughal Gardens that includes Chashma Shahi, the royal fountain; Pari Mahal, fairies' palace; Nishat Bhag, the garden of spring; Shalimar and Naseem Bhag. 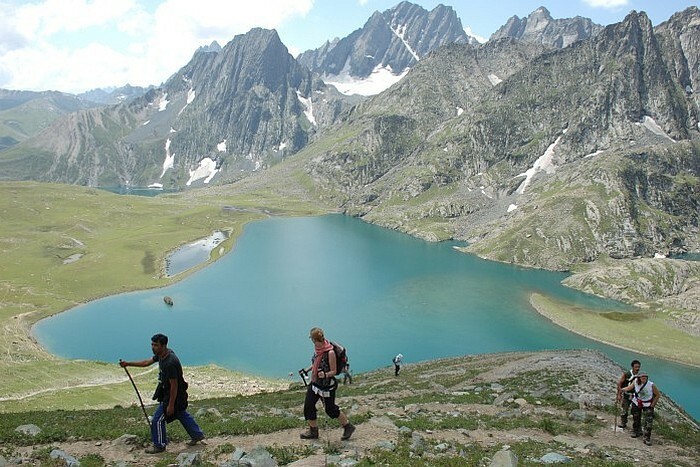 The trek would commence from Sonamarg, which is a three hour drive from Srinagar. So, to reach Sonamarg by night fall, the trekkers should start from Srinagar in the evening. The trekkers would spend the night in guest house at Sonamarg. Actual trek starts on day two. The second day is the most energetic day for the trekkers, since it will be the first day of trekking. The trek would start 3 to 4 kms from Sonamarg on Srinagar road. We would come across an isolated clean dhaba from where necessary items can be purchased for the journey. Sonamarg is 7,800 ft above sea level. The walking trail follows the beautiful Sindh River. The first three to four hours will be a steady ascent through magnificent maple and pine trees and beautiful green lush meadows. The beautiful forest of maple trees spread an amazing sweet scent in the air. The end of the maple tree forest gives away a clearing, from where we can witness the complete Sonamarg valley, clear streams and entire line of maple and pine trees. From here, the descent starts towards Shekdur. Shekdur is a collection of small peaks powdered with snow. And another three hours trek will take us to meadows of Shekdur surrounded by Bhoj trees. It is the ideal place to rest for sometime before further continuing. The descent will end in bhoj forest or silver birch. The golden setting sun is worth watching from here. After the silver birch trees, the trail will lead us up towards a river, which is the beginning of Nichnai. The river here is connected to Sindh River from Sonamarg. The river valley widens towards the end of the first day of trek and guides us to a triangular cluster of snow clad peaks, Nichnai. Nichnai is 11, 500 ft above sea level and the second day's night camp site. The third day of the trek is bit longer than the previous day and hence, it's best to start a little early, say around 8 A.M to give a good head start. The sight of the green meadows and the fresh scent of early morning would give us an added energy to trek. The first point we cross today is the Nichnai pass or the Vishansar berry. It will take an hour to cross the river and another hour walk on the banks of it. After crossing the river, the next hour would be to mount the Nichnai pass. On passing we will view a deep blue small lake, which is just a deception of Vishansar Lake. The Nichnai pass is quite wide with pure white snow clad mountains on the left and high land on the right. The Nichnai pass is 13, 500 ft above sea level and is a steep climb. But once we reach the highest peak, the trail descends rapidly from here. We would come across stunning meadows adorned with small bright red flowers. We can also see a clear, lively waterfall, falling from the adjoining cliff and meeting the river below. The descent will end on flat meadows. To the left of the track, we would observe astonishing Himalayan Mountains worth capturing in cameras. From here we have to follow the meadows and soon we would reach the end of the valley. A clear streams flows to our left. This stream meets the Vishansar Lake half a km away. We can camp for the day anywhere near the stream. One can take a view of the gigantic Vishansar Lake by walking along the stream, seven minutes from the camp site. The lake is maginifently large and is nestled in between four mountains. Early five day morning, we will observe the Kishansar peak reflecting in the lake. The view is breath taking. Our next leg of trek starts from here to Gadsar; a two hour steep climb, a few hours steep descent and a long gentle walk through the greens. First part of the day we do the climbing to reach the Kishansar peak, 500ft above Vishansar lake camp site. From here we would follow our trail to the lake and climb further on the other side of the Vishansar Lake. There are multiple trails on the way, few easy ones to walk and few difficult ones but with a better view below. In the second part of the day, we go up the Kishansar Lake by the meadows to the top of the ridge. Once reached, mount higher; say for 45 minutes to perceive an out of the world sight of the twin lakes, Vishansar and Kishansar lakes. From here, we climb further up to reach the Gadsar pass, 13, 800 ft above, which is considered the highest peak. We will start to descent from this point to flat meadows, covered with bright colored flowers. In between the descent, we will come across small lakes. One of them Yamsar, is quite famous. Once we have reached the multi colored Iris, we should know that Gadsar getting near. Gadsar Lake is one of the best and prettiest lakes to view. The lake is covered with blue flower beds on one side and snow covered mountains on the other side. We can either camp at Gadsar or at nearby army camp. We have to report at the army camp along with our ID proofs so as to acquire permission to pass Gadsar. The commence with a walk from the army camp towards the stream. The best way to head up the mountains is to cross the river. There is one more way to cross the river, through the over bridge one km from the camp site. The trail from here becomes steeper with every passing minute. Almost after a two hour climb, we would enter a flat terrain. Thereafter, the land will be even, surrounded by mountains and deep craters to our right. This place is known as Maengandob. We can take a short break here and move forward and cover little more distance to reach the first of Satsar lakes. Satsar, as the name itself says, is a group of seven lakes. We can notice the Army check post, which is the third line of defense from LOC at a distant. We should finish the same procedure with army officials as we had the day before and set our camps near the first lake of Satsar. The lake is beautiful, with mountains overlooking the water. Its surrounding gives a pleasant inner feeling and a peaceful night to sleep. This is the toughest among all days. Mentally and physically you will be challenged. The only way to keep going is the zeal to complete the wonderful trek. We start the day by reaching the biggest of the Satsar Lakes. The terrain today will be rocky and full of boulders. After passing the last of the Satsar lakes, we would start to descend. Half an hour walk later, we will arrive at the forest line. From the forest line, we would climb up the mountains to reach the desired altitude of 11, 800 ft. In between, you would come across few ridges at different altitudes. From here we can spot the Gujjar huts on the opposite mountains. After two more hours of steady mount, we will reach the final ridge at an altitude of 13, 400ft. The best part of the day 6's journey lies in here. From the top of the ridge, we will witness the view of the amazing twin lakes, Gangabal and Nundkol. The bigger one is the Gangabal. The lakes are connected with each other by a stream. On either side of the lakes, at a distant are two smaller lakes, names unknown. From here, we will face a steep rocky descent. we will cross a stream in between. An hour and half, a few ups and downs later we would enter green meadows. By following the meadows and a stream, we will finally get to Nundkol Lake. Many people from Gangabal and Naranag come here for weekend outing. We can see the Hurmukh peaks from the lake side. The twin lakes are famous for fishing. Trout fishes are popular here. Ganagabal Lake is twenty minutes from Nundkol Lake and to get there we will have to cross the stream by a man made bridge. We shall camp at the banks of Gangabal Lake for the night. Today is the final day of our trekking expedition. Yes, physically we will be tired and exhausted, but the thought of reaching our final destination will give us an extra strength and willpower to move on. We would start walking from the Gangabal camp site towards the tree line following the stream. After a half hour walk, we would enter a grassy land filled with pretty yellow flowers. After few kilometers, we will touch pine trees forest. Follow the forest line and walk for the next 6 to 7 kilometers. Thereafter, we would start to descend steadily for 4 kms and arrive at Naranag. This is the last leg of the trek. Few more meters and would finally reach our trek destination, Naranag Village, Ganderbal District. We can visit the Naranag Temple if not tired and ridden. We now drive back to Srinagar and settle down in guest house for the night. 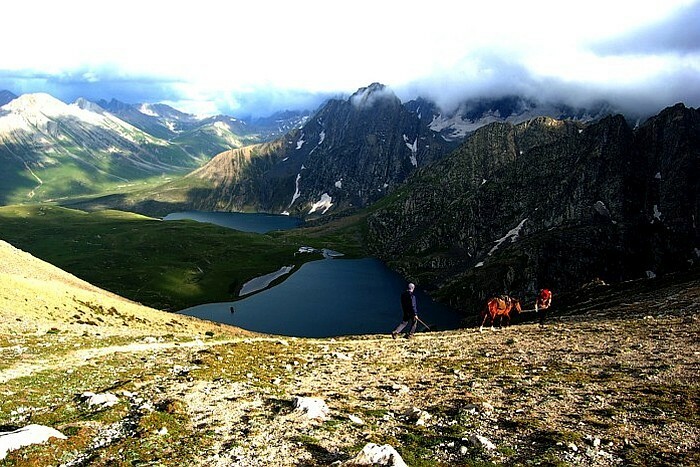 Kashmir Great lake trek is one trekking experience you would want to freeze in time's memory. This trek is for people who likes walking and appreciate the Nature and its assorted Flora and Fauna. Meals while on trek (Veg & Egg). Trek equipments like Sleeping bag, mattress, tent, kitchen tent, toilet tent. Note: The cost of transport from Srinagar to Sonmarg and return from Narnag to Srinagar has to be borne by the participant, arrangements with local transporters to pick up trekkers from Srinagar. The vehicles will leave Srinagar at 3.00 pm and reach Sonamarg by 6.00 pm.The stay at Srinagar on the last day is not included in the trek fee.